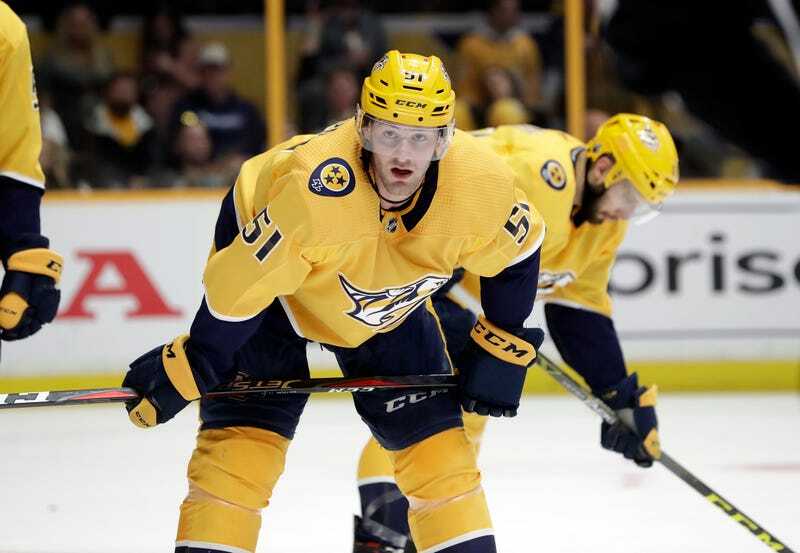 Nashville Predators winger Austin Watson has been suspended 27 games without pay—nearly a third of the season—for “unacceptable off-ice conduct,” for his June domestic assault arrest for an incident in which he struck and shoved his girlfriend, and to which he pleaded no contest. How did the league settle on 27 games? That’s a very good question. The NHL is the only one of the big four North American sports leagues that does not have a specific policy on domestic violence. In a statement, Gary Bettman offers zero transparency on the NHL’s investigation into Watson, its findings, or its disciplinary reasoning. What are those specific facts in this case? On the evening of June 16 in Franklin, Tenn., outside of Nashville, Watson was seen by a witness to “swat” his girlfriend, who is the mother of their then-two-month-old child, and prevent her from leaving the car at a gas station. The witness flagged down a passing police car, and the officers observed red marks on the victim’s chest; she told officers that Watson had caused them and that he “sometimes gets handsy.” Watson admitted to shoving her. The woman, according to the police report, asked officers not to do anything because it could affect Watson’s career. On July 24 Watson pleaded no-contest to misdemeanor domestic assault. He was sentenced to three months’ probation and ordered to complete a 26-week batterer’s intervention course, and an inpatient treatment program for drugs and alcohol. This is all, inevitably, a mess. Some fans are outraged that Watson’s suspension is just seven games more than the standard suspension for banned substances, though both that schedule and the league’s latitude in this instance are locked into the CBA. Some fans are upset that the NHL doesn’t have a formal policy like the other leagues, though of course those leagues have seen fit to ignore their own policy when they feel like. Many fans are disgusted that the union is appealing on Watson’s behalf to try to reduce his suspension, though that is the union’s job. All fans should be baffled by the lack of consistency the NHL has shown: suspending Slava Voynov indefinitely immediately upon his domestic violence arrest, and keeping him out of the league since; not suspending Semyon Varlamov for his domestic violence arrest (for which charges were later dropped when the victim refused to cooperate). But this stuff is without easy or universally satisfying answers—again, consider Watson’s girlfriend’s plea to police not to pursue this because it could affect his livelihood. I do not trust a sports league to be coherent or logically consistent in its treatment of domestic violence, and I certainly do not trust it to issue its rulings in service of the victim, or the perpetrator, or of anything other than the interests of the league itself. Whether the NHL moves toward a specific DV policy or not, that’s the only thing that will remain certain. Police Say Celtics&apos; Jabari Bird Assaulted, Choked, And Kidnapped Someone In "Domestic Incident"